During the 1980’s, the one and only true doll for boys was Action Man (or G.I. Joe in the US, which was the American version). Somehow calling it a doll doesn’t quite seem right, but I’m not sure what other words you could use to describe it other than “action figure”, but this always conjures up images of Star Wars toys in my mind. Action Man was a real man. Made of hard sculpted plastic bulging with muscles, most will remember Action Man best for his fuzzy crew cut hair and his gripping hands, which enabled him to hold all kinds of guns, rifles and other armaments. If you were really lucky you would have been given the ultimate version, the Eagle Eye edition, which had a little switch on the back of the head that made the eyes dart back and forth. Amazing how such a simple change made the Eagle Eye version so much more desirable, isn’t it! The standard Action Man was dressed as a typical army soldier in khaki uniform and giant black boots, but other versions that were available included a diver, a sailor and a tank commander. You could also turn your own Action Man into any of these and more since it was also possible to buy different uniforms and weapons for him separately. Towards the mid 1980’s, when the Action Man I know and love was phased out, there was even a Space Ranger action man dressed like an astronaut, in an attempt to combat Star Wars fever. Unfortunately this didn’t prove enough and the Action Man doll was phased out to be replaced by Action Force, a series of smaller poseable action figures. The period between Christmas and New Year has always been a strange one for TV schedules. The TV stations have not yet bothered to go back to the normal TV schedules, which makes sense since we’re only talking about a couple of days here. However, since many people have returned to work or have other things to do, it’s also not worth putting on any blockbuster films or Christmas specials during this time, so instead the TV schedules get filled with things you’ve probably seen many times before. Digby The Biggest Dog In The World is a great example of the kind of filler material that the TV stations would show during this TV lapse period during the 1980’s. The film was made in 1973 so it was both old enough and of the right kind of quality to slot perfectly into the schedules. That’s not to say it’s a bad film, just that it’s not exactly a blockbuster. It stars both the late Spike Milligan and Jim Dale, who was in many of the later Carry On films. Today Is Saturday. Watch And Smile. 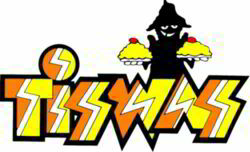 If you ever wondered why ITV’s anarchic Saturday morning TV show was called Tiswas, then there is your answer. Before Chris Tarrant started to annoy us all by asking Who Wants To Be A Millionaire contestants if they were sure C was their final answer, and when Lenny Henry was still funny (sorry Lenny, it all started to go downhill after Delbert Wilkins), Saturday mornings were ruled over by a crazy mess of flans, water, musical guests and mad presenters who didn’t care what they were doing so long as someone got either wet or covered in foam. Chris Tarrant and Sally James were the main hosts of the show, but only really because they were most capable of appearing sane for short periods of time. Chris would keep the show moving along, and was normally armed with a clipboard if I remember rightly. Sally James main role was to provide us with one of her “almost legendary pop interviews”, where she would ask questions to whichever musical act happened to be on that week. There was one particular shop in the town where I live that did have some good bargains though. This was the local independant department store, a bit like one of the John Lewis stores but on a bit smaller scale. They would always have some great bargains on some of the more expensive items they sold, such as furniture, and because of this people would actually camp out in the shop entrance and along the street on Christmas Day and Boxing Day (in those days Boxing Day was still a non-shopping day, not like it is today) waiting for the shop to open so they could run and claim the bargain they had their eye on. The sale items were usually advertised in the window, so people had a good idea of what they wanted to get. One year the queue was so long it even made it onto the local television news! The other thing I liked about the Christmas sales were the TV adverts advertising them. Normally these were national department stores and furniture stores. The one that made me laugh the most was the one for Courts, the furniture store that is no longer trading in the UK, although they do still have a presence in other countries. Courts always seemed to have a sale on all year round, so when their advert came on you always thought it was only about a week since the last one. Courts always seemed to have an advert some time in January saying “Sale must end soon” which was even funnier. 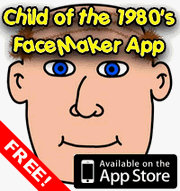 Firstly let me pass on a big Child Of The 1980’s Merry Christmas wish to all our readers! We hope you all have a great day, just go easy on the mince pies, okay! 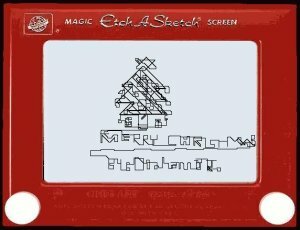 In the spirit of giving though, we thought we’d share the rather excellent Online Etch-A-Sketch website which allows you to relive all those happy hours you spent fiddling about with your Etch-A-Sketch as a kid. It’s not quite the same as it doesn’t involve twiddling the two knobs to make it work, just the arrow keys, but its still a lot of fun. The picture accompanying this post was created using it, unfortunately I don’t know by whom, but why not see if you can do better! The games may look laughable by todays standards, but when the Atari 2600 launched in 1977 it was state of the art. Before then, games consoles had often been monochrome with a limited number of games, normally all of which were just slight variations on Pong. The Atari 2600 blew those machines out of the water with its colour graphics and, most importantly, wide range of varied games. It also reinvented the method of control by coming with a 8 directional, single buttoned joystick. Prior to this most machines used a twisty dial thing to control the game, which is why Pong was so prevalent – it was about the only game you could do on such a system. The looks of the console fit well with the television sets of the era, with a wooden panel along the front, a series of switches to control difficulty levels and so on, and a big slot that accepted a plastic cartridge containing the games themselves. 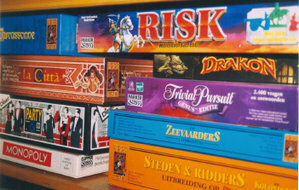 There was a wide range of games available, some good, some bad and some truly terrible (even taking into account the limited power of the machine). Some of the better examples were Space Invaders, Yars Revenge and Breakout. There was a fairly mediocre version of Pacman too, but some awful ones such as Haunted House and ET. I’m sure that the vast majority of you looked forward to the end of school term, for the obvious reason that you were going to get some time off school to do whatever you wanted. That last school day before the holidays always felt special, and it was especially good when your teacher felt that way too and decided we could put normal lessons to one side and enjoy ourselves. The best chances of the teacher getting into the holiday mood were at the end of a full term when you would be on holiday for two weeks or more, that is the Easter, Summer and Christmas holidays. The half term break was not generally deemed exciting enough for the teacher to give the class some fun time. Primary school was the best for end of term fun. Our school allowed us to bring in games from home to play with our school mates, and whilst there may have been some work left for us to do, such as cleaning out our tidy trays or helping the teachers remove that terms paintings from the school walls so we could take them home, plenty of time was still available for play. 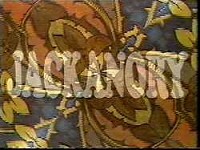 Jackanory was recently brought back to our TV screens, albeit jazzed up somewhat with fancy computer effects and animation. In our day however, Jackanory was considerably less high-tech, but the overall aim of the programme was the same – to tell a classic childrens story over the course of a week or so. The format was surprisingly simple. Each week a different celebrity would be called in to read a much loved childrens story. Classics such as Charlie and the Chocolate Factory, Charlotte’s Web, Treasure Island or even the Beatrix Potter books were often the fodder used. The celebrity would normally be seated in a comfortable chair and would read the story to camera, whilst illustrations would be shown at key points, with the celebrity becoming a voice over. If the story being read was a book famous for its illustrations (Beatrix Potter’s Peter Rabbit being a great example) then the illustrations accompanying the story would be those from the book itself. If the book didn’t have illustrations, or perhaps they were only black and white images, then the BBC would supply their own images, which were sometimes animated, although usually only very simply. A good example here would be the bit in Charlie and the Chocolate Factory where Augustus Gloop gets stuck in a pipe. This was animated by having a cut out of Augustus (presumably on a stick) moved slowly up behind a picture of a pipe.